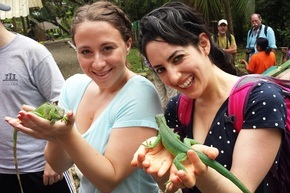 Sign up here to get discount codes to 2015 tours and updates about Greener Travel! Special discounts: We are offering a discount of $250 off the Costa Rica trips, $200 off the Baja Safari, and $50 off the cost of the Maine dogsled trip! We are a DC based adventure travel company that offers both individually tailored and group trips to Costa Rica as well as Jewish group adventures to Costa Rica, Maine, Alaska, Baja Sur and Trinidad & Tobago. We attract travelers who want to have an authentic, relaxing vacation - yet be off the beaten path at the same time. In the coming months we will be holding happy hour events across the country – please drop by - you are welcome have a drink, learn more about our trips and meet other cool travelers – as well as some of our trip alumni! We were excited to be included in NY Bluprint's Top Eight Jewish Trips Around The World!